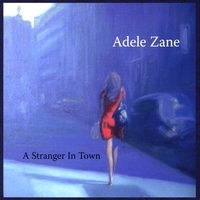 I arranged, co-produced and played all guitar tracks on vocalist Adele Zane’s new project. As much in the pop world as the jazz without losing the best qualities of each genre. Standards (but not your uncle’s standards) and covers of That’s the Way (Led Zepplin), Ruby Tuesday (The Stones), In the Darkest Place (Burt Bacharach and Elvis Costello), and Because of Toledo (Blue Nile). This was a fun project to work on because it combined a sense of the familiar with some new twists. The standard “jazz” tunes all got a makeover influenced by the “rock” world (albeit with clean guitar sound). I broke out the slide for the solo on It Never Entered…, and used delay to create a pad for Where or When. Ruby Tuesday, on the other hand, got a brand new harmonic treatment and Two Different Worlds, a somewhat obscure standard, went full on Nashville 1967.